This year’s Society of North American Goldsmiths (SNAG) conference may have been the organization’s 47th time meeting, but it was my very first time attending. Sitting in the lecture halls with over 600 hundred fellow makers felt like being at a gigantic family reunion. The theme for this year’s conference was MADE: Makers Across Disciplines Engage, and had makers across North America engage by meeting up in Portland, Oregon to talk shop. And talk shop we did. It would be challenging to try to describe the stimulation you get from attending the conference, listening to the many inspiring speakers and meeting artists you thought you might never meet in person. Yet, there was one particular feeling that stayed with me as I made the drive back home, across the border, from Portland to Vancouver: pride. I felt proud to see the work of fellow Canadian jewellers and metalsmiths so well-represented south of the border. This year’s Adorned Spaces, a juried two day event featuring pop up galleries with works for sale, included 21 exhibitors ranging from solo shows to university group collaborations – two of which presented exclusively Canadian artists. Place, a group show organized by the Vancouver Metal Arts Association, showcased artists from Alberta and British Columbia, whose work explores traditional and innovative techniques whilst pushing the boundary of the field with the integration of traditional and non-traditional jewellery materials. The exhibition presented a selection of makers from the neighbouring provinces, examining how location and environment can inform both the content and use of materials within their work. One of the pieces in the show, 'Where’s your other half?' by Vancouver artist Bridget Catchpole, is created from her collection of found plastics washed up along the Pacific Rim National Park. The marine debris integrated with intricately strung vintage Italian glass beads, embodies this fluid relationship between the old and the new through consideration of material and process. The work of Louise Perrone also exemplifies this symbiosis of tradition and innovation. Perrone is a BC based artist, originally from the UK, who completed her studies at the Alberta College of Art and Design. 'Now you see me', a part of her new Reflected series incorporates futuristic-looking nylon material with a reflective coating that has been hand sewn using traditional textile techniques - another example of how these Western Canadian artists are pushing, pulling and playing with the notions of old and new. In the other salon space for Adorned Spaces, the work of Halifax artist Anastasia Pindera boldly invited viewers to investigate the relationship between body and adornment. Her work titled Docile Bodies, examines the feminine body as an object of control. Pindera manipulates tough brass rod into soft, yet constraining adornment, which contrasts the body image of the wearer with its imposed control. A cross-breed of sculpture and body ornament, Pindera uses photography to document the work on the body; to further express the uncomfortable, yet curious, encounter where metal meets flesh. Pindera created her custom displays herself and brought them from Nova Scotia, to execute her solo pop up exhibition in Adorned Spaces. SNAG’s Gallery Crawl included ten official spaces situated throughout Portland’s Pearl District, with exhibitions highlighting local and visiting artists. 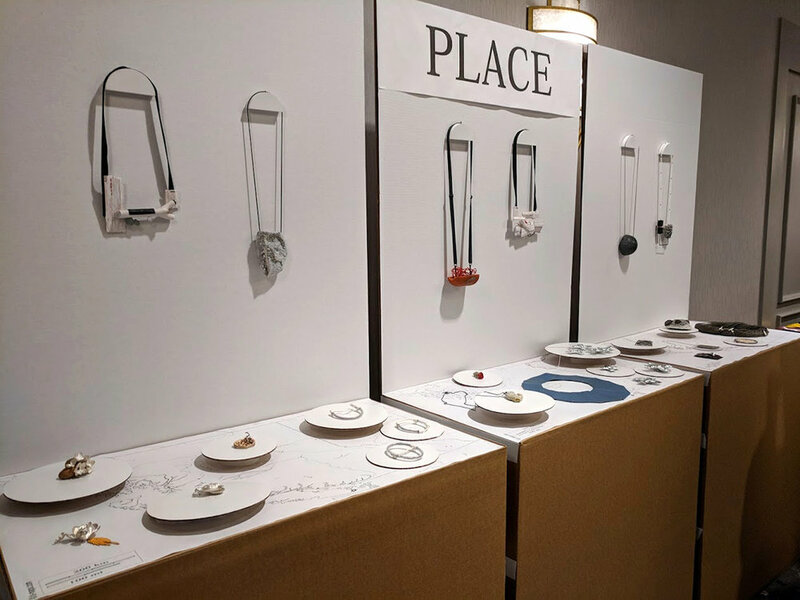 ‘Northwest Passage’ at Alchemy was notable, hosting a fine art and craft jewellery exhibition curated by award-winning SNAG member, Amarette Gregor. The show included work from 24 artists who have lived, worked or studied in the Pacific Northwest and celebrated the special relationship craft objects have with physical space. Gregor’s call for entry asked artists to consider the power of seeing an object in person and interacting with it in a shared physical space during this age of digital connection. Her exhibition explores these physical ties, bringing visitors face to face with craft objects by artists who have moved through the Pacific Northwest region at some point in their creative development. Gregor feels that artists may now maintain connections through modern digital means, but they have also shared and been shaped by real-world geography. Jan Smith, one of the exhibiting artists in Northwest Passage, has lived and worked cross-border throughout the Pacific Northwest.